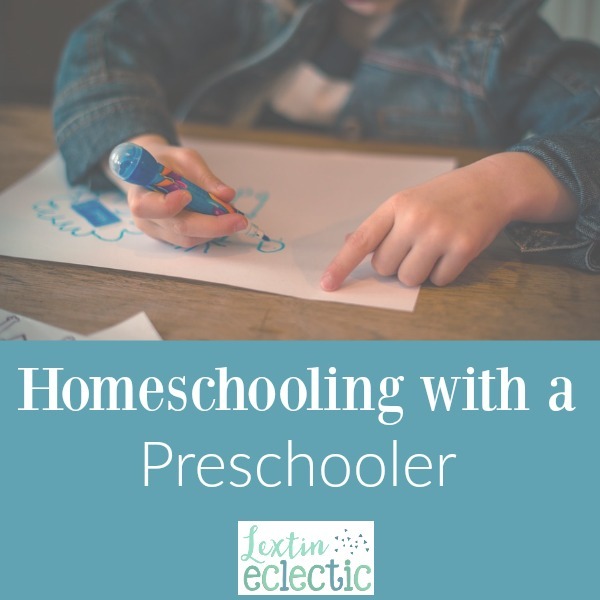 Have you ever wondered what it would be like to homeschool older children with a preschooler tagging along? Well, you don’t need to wonder any longer. I’m here to tell you that it can sometimes be so terribly awful. Of course, sometimes it’s wonderful and fun. But it’s sometimes not very fun if I’m being completely honest. Let me tell you a little bit about my day and you can decide if you think it sounds fun or not. I am part homeschool ninja mom because I homeschool my oldest 3 children very early in the morning before my tiny people are awake. I do this because explaining how to convert a fraction into a decimal while also holding a fussy baby or arguing with a toddler is basically impossible. I’m not going there anymore. Now I eat lots and lots of chocolate to help me cope with my early mornings. However, despite my ninja skills, some of our homeschool does happen during regular daylight hours. My preschooler joins us during our morning time at breakfast. We work on catechism or Bible verses and recite poems. She spends at least 5 minutes whining about whatever we are having for breakfast. To her, picky eating is more like a competitive sport. Basically she hates all. the. things. Then when it’s her turn to answer a question or say a nursery rhyme, she whispers the answer as softly as possible. She knows that I can’t hear a word she says over the squealing of the baby. She becomes drunk with power as she forces me to repeat my question about 6 times. Unfortunately for her, I am just as stubborn as she is, so I continue until she says “Twinkle Twinkle Little Star” at the top of her lungs. Winning! Next I usually do her school time; however, she spends our entire time whining so I’ve scrapped all of my lofty preschool plans. I’m a horrible homeschool mom. Sigh. During Kindergarten, my preschooler colors pictures and tries to sneakily steal her sister’s coloring book to scribble on her pages. When my kids grow up I think I will apply for the Peace Corps. I have lots of practice diffusing major wars over princess coloring pages. I have to take a break midway through Kindergarten to recap all of the markers that the preschooler opened. Why do I give her markers, you ask? Don’t I know about colored pencils or crayons? Yes. Yes I do. However, she won’t use those. And it’s not a battle I’m going to fight at 9 AM. So, I am her little minion capping all of her markers as she scribbles. By the time I am done with Kindergarten I only have a tiny shred of sanity left. Then it’s time to work with my son on his school, because he moves slower than a snail and is never done with school during our morning time. Also, he is so grouchy until after about 9 AM that I have him work independently and far away from everyone – including the dog. At this point, my preschooler can sometimes be persuaded to go play with her sisters. But this is only after she has asked for a piece of candy about 100 million times. Let me talk about this said candy…Every week I go through my house and purge it of all candy. Yet, every Sunday my kids are given candy at church. For the love of everything that is holy I’m going to have to eradicate candy from church. I’m convinced that the love of candy is the root of all evil when it comes to children. It should be a sermon. I appease her with a small snack (that does not include candy) and I try to drag my son through some schoolwork while pretending to be all cheerful and optimistic. Then the homeschool gymnastics begin. She sits on my lap. She wants down. She wants something from the top shelf. She wants to sit in a chair. The chair is too far from the table. Then the chair is too close to the table. Then she wants me again. Then she wants paper. Then markers. Then pencils. Then glue. And then we’re back to begging for candy. During our group school time, everyone is supposed to sit idyllically around my homeschool chair while I read beautiful and inspiring read alouds and we have history and science discussions. At least, that’s how group school sounded on the other homeschool blogs. No. My preschooler whines during the entire time. If I try to remove her from the room she shrieks like a banshee. If I try to distract her with a toy she shrieks like a maniac. If I try to reason with her…well, you can imagine how that goes! I do not know what it is about our group school time. Every time I sit down and pull out a book she loses her little mind. She can’t stand that she doesn’t have my full attention and she is hell bent on making sure she remains the center of attention. It is so amazingly awful. There are truly no words. Sometimes I can appease the preschool tornado by allowing her to sit in the chair with me. Usually this too fails. Why? Because during group school she decides that she cannot live without daddy. So she screams for him until she’s delirious. I’ll tell you a secret. My hubby really loves getting phone calls right around lunchtime with a shrieking preschooler in the background. He then goes into hostage negotiator mode and talks her down from the edge of crazy. That’s why he’s awesome! And that’s what it’s like to homeschool with preschoolers. It’s so fun! Ok – full disclaimer. She is sometimes so angelic and charming and adorable and wonderful. Is it multiple personality disorder? No, I’ve discovered that she’s going through a bit of a clingy phase. A bit? Oh, who am I kidding. It’s a major clingy phase! She’s also a wee bit irrational and very short on patience. Pretty typical for her age, actually. It is possible to homeschool with little ones. It’s a crazy adventure (nightmare?) that requires some planning and a lot of patience. But it can be done! I’m still alive and I’m on my 5th preschooler. You can get through this! Stay tuned next week as I share some tips to help your day run more smoothly even if you have little people who sabotage your homeschool. Oh. My. Goodness. This is so funny, and SO true!! I go through the exact same thing. In fact, it was through reading your blog that I started to wake up my older children early in the morning to complete core subjects prior to breakfast, and most importantly, before the younger kiddos wake up (by the way, this is working so well for us!). Sometimes it feels impossible to adequately homeschool older children with toddlers/babies, and I struggle with whether it would be more beneficial to the kids to be in school. With #5 due in October, I have tried not to get too stressed with ow much things will change. I can only leave it in God’s hands and have faith that I am doing the right thing. It is SO HARD to homeschool with littles. Oh I’ve been there (and I’m still there). But it can be done. And waking my kids up early sounded completely crazy but it has been the very best thing. My kids love the early morning quiet where we can work without interruptions. We are so efficient! I’m so glad it’s working for you as well. Things will change for you in October but you’ll find a new schedule and new routine and it will work. Being able to homeschool is such a huge blessing. And I can promise that as your kids get a little older it’s even more fun and rewarding to learn alongside them. I’m thankful that we’ve stuck it out for the past few years even when it was hard. And I’ve had many days where I’ve cried to my husband that I couldn’t do it anymore. I hope you have a great school year!